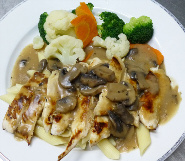 A popular Italian dish made from grilled chicken with mushroom sauce and marsala wine. Served with penne pasta and steamed vegetables. Breaded chicken or beef cultlets. Served with penne pasta, marinara sauce and steamed vegetables. Four cheese Homemade ground beef and Italian sausage lasagna. Large size. ( 8 Slices ).